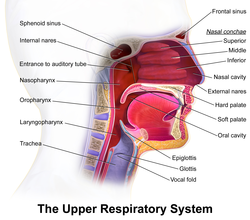 Upper respiratory system, with hard palate labeled at right. The hard palate is a thin horizontal bony plate made up of two bones of the facial skeleton, located in the roof of the mouth. The bones are the palatine process of the maxilla and the horizontal plate of palatine bone. The hard palate spans the alveolar arch formed by the alveolar process that holds the upper teeth (when these are developed). The hard palate is formed by the palatine process of the maxilla and horizontal plate of palatine bone. It forms a partition between the nasal passages and the mouth. On the anterior portion of the roof of the hard palate are the plicae, irregular ridges in the mucous membrane that help facilitate the movement of food backward towards the larynx. This partition is continued deeper into the mouth by a fleshy extension called the soft palate. The hard palate is important for feeding and speech. Mammals with a defective hard palate may die shortly after birth due to inability to suckle (see Cleft palate below). It is also involved in mastication in many species. 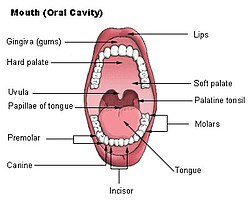 The interaction between the tongue and the hard palate is essential in the formation of certain speech sounds, notably palatal consonants such as /j/ and /ɟ/. In the birth defect called cleft palate, the left and right portions of this plate are not joined, forming a gap between the mouth and nasal passage (a related defect affecting the face is cleft lip). While cleft palate has a severe impact upon the ability to nurse and speak, it is now successfully treated through reconstructive surgical procedures at an early age, where such procedures are available. The proximity of the dento-alveolar process explains the forming of palatal abscesses and the palatal mucosa and submucosa with its numerous glands and the squamous keratinized epithelium is in correlation with the rich tumoral pathology. Long-term use of chloroquine diphosphatase drug, which is prescribed in malaria prophylaxis, and rheumatoid arthritis was found to cause bluish - grey pigmentation in the hard palate. ^ Roman⁠, Alexandru Gabriel; Mițariu⁠, Mihaela Cernușcă; Mițariu⁠, Mihai (June 2012). "Palatul dur — La granița dintre patologia tumorală și cea infecțioasă" [Palate – the border between tumor pathology and the infectious]. Revista de Chirurgie Oro-maxilo-facială și Implantologie (in Romanian). 3 (2): 14–7. ^ Manger, Karin; von Streitberg, Ulrich; Seitz, Gerhard; Kleyer, Arnd; Manger, Bernhard (2017-11-28). "Hard Palate Hyperpigmentation-a Rare Side Effect of Antimalarials". Arthritis & Rheumatology. 70 (1): 152. doi:10.1002/art.40327. ISSN 2326-5191. PMID 28941224. ^ de Andrade, Bruno-Augusto-Benevenuto; Padron-Alvarado, Nelson-Alejandro; Muñoz-Campos, Edgar-Manuel; Morais, Thayná-Melo-de Lima; Martinez-Pedraza, Ricardo (2017-12-01). "Hyperpigmentation of hard palate induced by chloroquine therapy". Journal of Clinical and Experimental Dentistry. 9 (12): e1487–e1491. doi:10.4317/jced.54387. ISSN 1989-5488. PMC 5794129. PMID 29410767.